Here are some contact details for major daily deals sites in Ireland. These details may change from time-to-time so we cannot guarantee these details will always be 100% correct. That said we’ll do our best to keep everything up-to-date and if you come across any updated details let us know and we’ll update the page whenever we can. If your query relates to a return or refund please note that you are to a 14 day cooling off period where you may receive a refund as stipulated in the EU Consumer Rights Directive. More information on consumer rights may be found on the Citizen’s Information website. 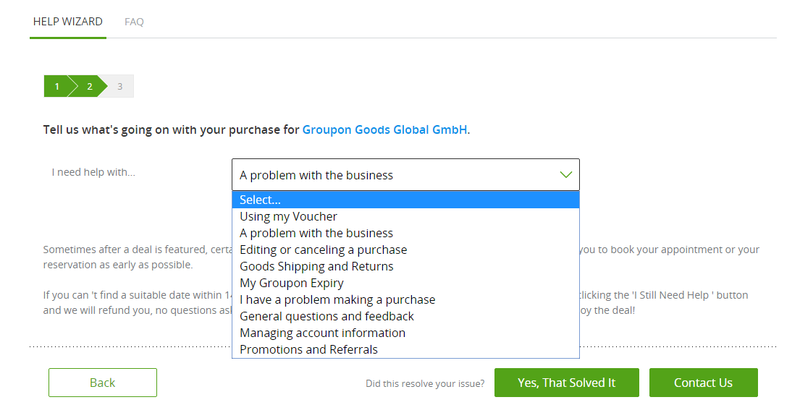 You can contact Groupon and make a query about any purchases by going to customer support. Here you can track orders and take other actions relating to your purchase. You should also check out there FAQ page which details what to do in a wide variety of circumstances. 1. Please get in touch with the merchant to enquire about the returns process. The merchant’s contact details can be found on your voucher visible in your Groupon account and on the deal page, also accessible from your Groupon account by clicking on the deal name. 2. Include a copy of your Groupon voucher in your package to allow us to identify your order. 3. When you return your product, please obtain proof of postage. We recommend using a trackable delivery service. 4. To speed up your refund, if you can please get in touch and send us proof of postage (ideally tracking information) by clicking ‘I still need help’. You should also be able to contact Groupon by email using the email address support@groupon.ie. There were a few changes in April 2016 when a merger with UK brand Wowcher came into effect. LivingSocial have a handy FAQ section on their website. Like Groupon your 14 day statutory ‘cooling off’ applies. If you have an issue with your vouchers or account you can contact LivingSocial +353 015 269 686 or contact them via their contact form. In the first instance your complaint should be addressed to the supplying merchant directly who should be able to answer any concerns that you may have. If you are unable to reach a satisfactory conclusion with the merchant please contact us and we will be able to look into any concerns you may have. Pigsback run a number of sites including LuxuryBreaks.ie, TheDiningRoom.ie and TheBeautyLounge.ie. The Pigsback knowledgebase has details on everything from ‘Piggypoints’ to applying for a refund. You can apply for a refund via this form. If you another query you might try helpdesk@pigsback.com. You can contact pamper.ie on info@pamper.ie. Pamper.ie do have a ‘terms and conditions‘ page where they deal with their refunds policy. You can contact Dealrush via their email address on contact@dealrush.ie. You cam also view their ‘terms and conditions‘ page where they deal with their refunds policy. You can contact Escapes.ie via their email address on info@escapes.ie. You cam also view their ‘terms and conditions‘ page where they deal with their refunds policy. Menupages only provide restaurant deals in Dublin. They do have a FAQ page and can be contacted info@menupages.ie. You can also make general queries on +353 1 240 5590or via their feedback form. Ocean deals mainly provide daily deals in Sligo and the North-west of Ireland. Ocean Deals may be contacted by email at info@oceandeals.ie or by phone on +353 71 9118103.